We are all hopping today along with Hero Arts. Please come join us! A Hero Arts Christmas Card! As you are know that we are celebrating Hero Arts this month. I love Hero Arts products. My favourite is the new Stamp and Cut stamp sets. How cool is to have both stamp set and coordinating die in one set at an reasonable price.I have a few of them. 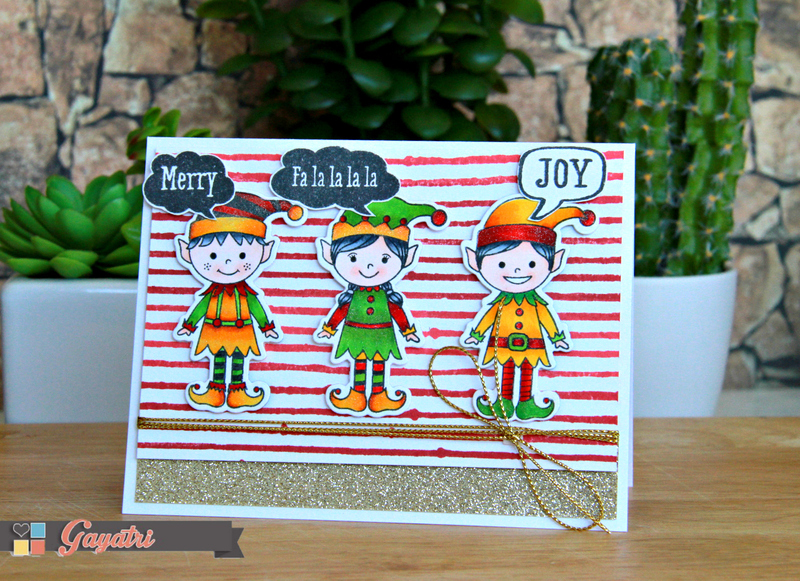 On my card below I am using one such Stamp and Cut set called Santa’s Elves. For the background, I used Hero Arts Light to Red Royal ombre ink pad on Drippy Lines Bold Prints background stamp. Love the ombre effect on the background. I trimmed the panel and added a strip of gold glitter. I tied a gold twine around the background panel. Then mounted the three Elves using foam adhesives. The sentiment is from an older Hero Arts stamp set released last year. Here is the closeup of the card. There are two $25 gift certificate to giveaway this month. For more details, check out this Rafflecopter. Hi, Bhavana here!! We are celebrating Hero arts love fest here this month at A blog named hero. I have a card to share to show my love for Hero arts. I love the Hero arts looped circle pattern background stamp. I stamped in black archival ink on watercolor paper and added red/green colors using Gansai tambi watercolors. Gold embossed a piece of paper and die cut the merry word and stamped the remaining part of the sentiment and used foam tape to add dimension. I layered the merry word to give dimension. Also added Pretty pink posh classic christmas sequins. 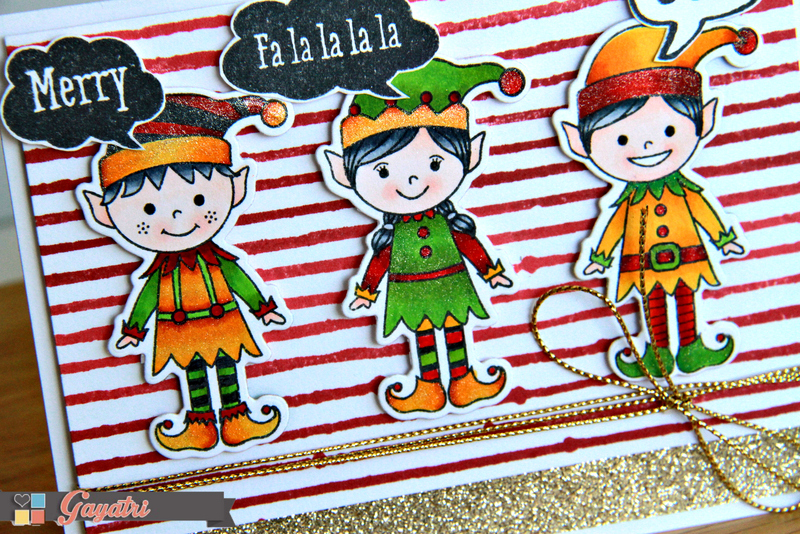 When I saw the Garland Bold Prints background stamp in the holiday Hero Arts catalog I totally fell head over heels for it and got it as soon as it was available online. 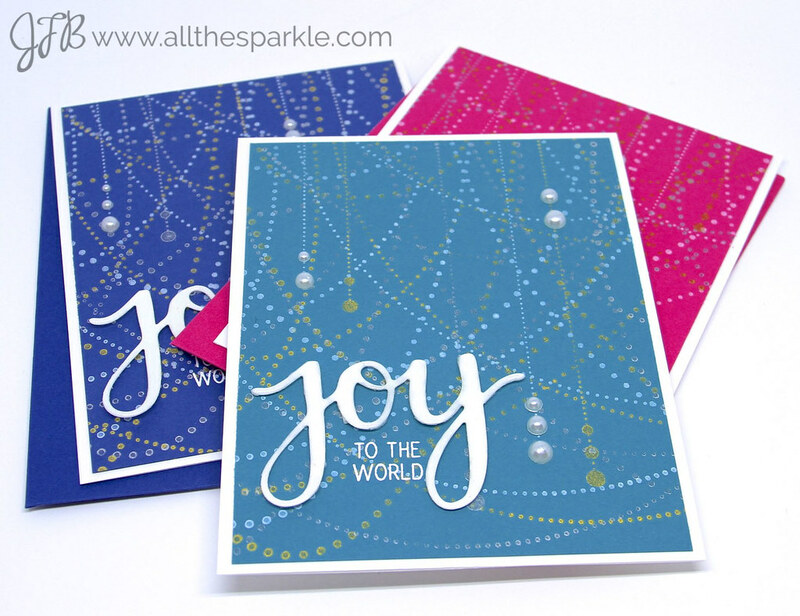 I brainstormed ideas for it but nothing quite fit until I saw these gorgeous cards by Amy and Suzanne on the Hero Arts blog! 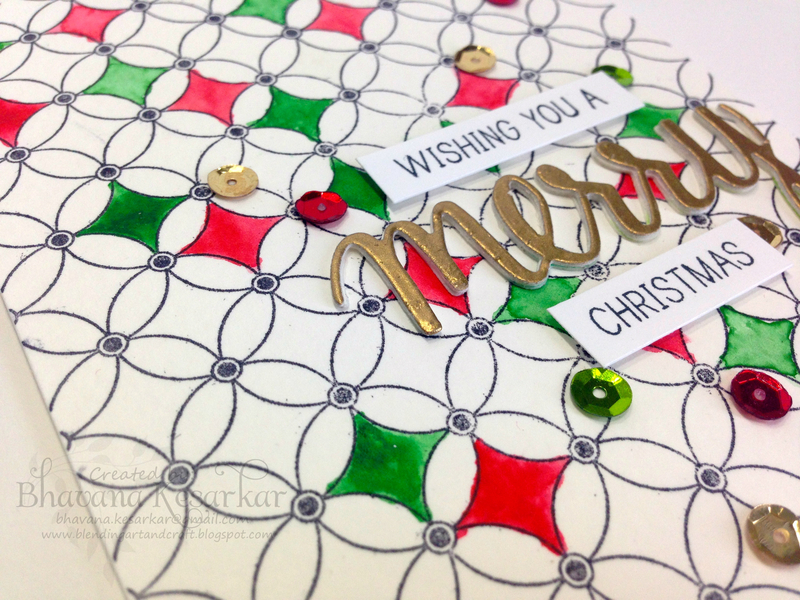 I loved the way Amy used the stamp as the focal image for her card but I also loved how Suzanne used multiple stampings of the background stamp. When I heard we were doing a month of Hero Arts love I knew I wanted to CASE these two talented ladies! I also loved Amy’s use of non-traditional Christmas colors so I decided to go with pink, teal, and royal blue! To create my card I attached the Garland Bold Prints background stamp in the center of my MISTI and went over my cardstock with a powder tool. Then I temporarily adhered my cardstock panel to the inside of my MISTI, inked the stamp with Hero Arts Unicorn White pigment ink and stamped it onto my cardstock. I like to use the MISTI for large background stamps because it allows me to restamp if necessary. Once I was happy with the white coverage I moved my cardstock slightly to one side and slightly lower. I reinked the stamp with a gold silver pigment ink and stamped the background stamp again. I moved the cardstock and repeated the process with a gold pigment ink. Then I let them dry overnight so that the pigment ink wouldn’t smear. The following day I trimmed the panel down and adhered them to white cardstock bases. Then I stamped the second half of the sentiment and heat-embossed it with white embossing powder. I die-cut the word ‘joy’ and embossed it with ultra high embossing powder before adhering it around the rest of the sentiment with small pieces of foam mounting tape. Finally I added a few white pearls to cover some of the dots in the garland. And to make our celebration just a little more special we are giving away TWO $25 gift certificates to Hero Arts! Thanks so much for visiting and have a fabulous weekend!! It’s winner time at A Blog Named Hero! We want to thank you all for participating in our challenges each month, and a big thank you to October’s collaborating company, Lawn Fawn, who provided us with fabulous products to play with. Please email us at ablognamedhero@gmail.com, with the subject line “Challenge Winner” and we’ll get your gift vouchers out to you as soon as possible! Thanks again to everyone for participating! There are no challenges this month but we have two $25 Hero Arts gift certificates up for grabs to anyone who comments on any of this month’s posts! !